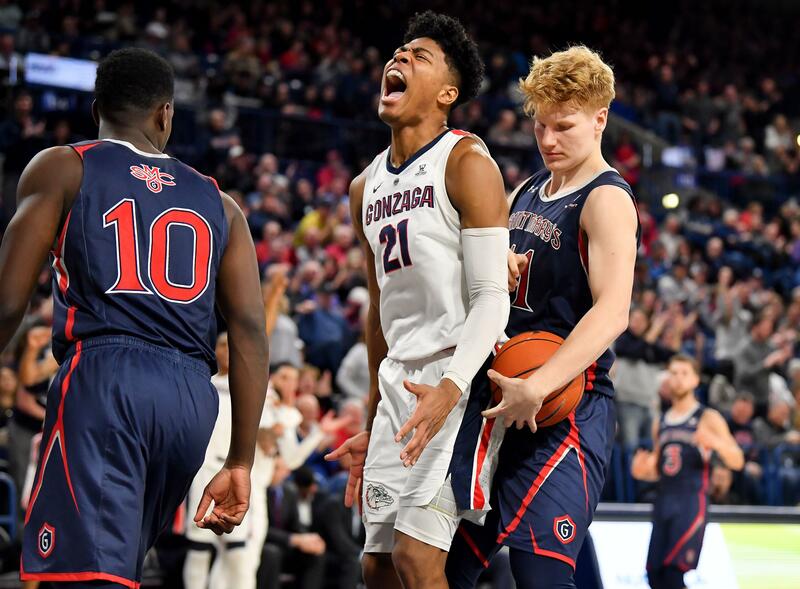 There was Rui Hachimura eluding Saint Mary’s guard Jordan Ford with a dazzling spin move for a layup. There was Zach Norvell Jr.’s 3-pointer set up by Geno Crandall’s behind-the-back pass. There was Crandall’s circus hanging layup over 6-foot-10 Jordan Hunter. There was Josh Perkins swatting Ford’s shot, followed seconds later by Brandon Clarke rejecting Dan Fotu’s attempt. There was that point late in the first half when Gonzaga took balanced offense to an extreme. The Zags were shooting 62.5 percent inside the arc and 62.5 percent on 3-pointers. And there was that 33-point halftime lead over Saint Mary’s. It was that kind of night for No. 4 Gonzaga, which put the rival Gaels through one of their worst nights in decades. The Zags cruised 94-46, delighting a boisterous gathering of 6,000 Thursday at the McCarthey Athletic Center and handing coach Randy Bennett his worst loss in 18 seasons at Saint Mary’s. The Gaels (15-10, 6-4 WCC) suffered the fourth-most lopsided defeat in program history. The Zags (23-2, 10-0 WCC), winners of 14 straight, have posted numerous blowouts this season, but in the last 10 days they’ve clobbered second-place BYU by 30 in Provo, Utah, San Francisco by 30 and dispatched the Gaels (15-10, 6-4) by 48. USF and SMC share third place. Saint Mary’s entered the game No. 12 in KenPom’s offensive efficiency ratings and No. 45 in the NET rankings. The Gaels finished with one assist and shot 25.9 percent from the floor. On a day when the Zags learned that junior forward Killian Tillie has a partially torn ligament in his right foot and is expected to miss at least the rest of the regular season, Gonzaga responded with perhaps its finest 20 minutes, building a 53-20 halftime lead. There are several worthy candidates against some of the better teams on the schedule, including the 52-29 second half on Arizona, a 62-point second half versus Creighton, and blistering halves against BYU and San Francisco. It started at the opening tip, won by Clarke and followed up 14 seconds later by a Clarke jump hook. The Zags led 9-0 less than 2 minutes in when Bennett was forced to burn a timeout to try to slow the momentum. It was 14-2 a couple of minutes later on Hachimura’s layup off a Perkins’ lob pass and 30-10 midway through the half. Gonzaga owned the lane, piling up 52 paint points. Clarke and Hachimura combined to make 17 of 23 shots en route to 42 points. Freshman Filip Petrusev, who stepped in as the third big with Tillie sidelined, had 15 points in 21 minutes. Hachimura, who turned 21 on Thursday, celebrated with 18 points, surpassing 1,000 for his career. He has feasted on the Gaels in the last three series meetings. He was Gonzaga’s leading scorer in two games last year with 21 and 23 points. The Zags also won the boards 42-31. Gonzaga shut down Ford, the WCC’s leading scorer at 22.1 points, and forward Malik Fitts, who averages 19.2 points in conference games. Ford, hounded by Perkins and Crandall, scored a season-low eight points on 3-of-12 shooting. Fitts finished with 11 points. Perkins finished with nine assists to move into second place in program history with 648 career assists. Matt Santangelo is first with 688. Published: Feb. 9, 2019, 10:53 p.m. Updated: Feb. 9, 2019, 11:34 p.m.